The final draft of the Iowa City Bicycle Master Plan was adopted by the Iowa City City Council on Tuesday, Aug. 1, 2017. Learn how the Iowa City Bicycle Master Plan was created. Take a look at the various tools used to identify the proposed network and facility types. This includes mapping of destinations and sources of ridership and as well as input gathered through the online mapping tool, surveys, and previous workshop. Review the Goals and Visions for the plan, as well as the overview of Iowa City’s Current Bicycling Conditions Report. For questions or to provide feedback, email Sarah Walz at Sarah-Walz@iowa-city.org. The Bicycle Master Plan envisions Iowa City as a community where people of all ages and abilities have access to a comfortable, safe, and connected network of bicycle facilities, and where bicycling is an integral part of daily life and culture, creating affordable access to recreation, jobs, schools, and other essential activities. Building upon other City planning efforts, the plan will create a framework for expanding Iowa City’s bicycle network, expanding the role that bicycling plays in achieving the City’s stated goals for transportation, economic development, neighborhood livability, community identity, safety, environmental preservation, and health and wellness. Through comprehensive and inclusive public input and careful analysis, the plan will identify near- and long-term strategies and prioritized actions for increasing bicycle ridership, comfort, connectivity, and safety for bicyclists of all ages and abilities throughout Iowa City. This includes identifying a set of timely actions and improvements to achieve a League of American Bicyclists “Bike Friendly Community” GOLD Status. The Iowa City City Council has made it a strategic priority to attain the League of American Bicyclists GOLD Bike Friendly Community status. Read the feedback from our 2013 application. Visit the consultant's webpage for additional information on the bike plan. The City of Iowa City is producing a series of short videos, or video shorts, that will focus on bicycle education and safety. 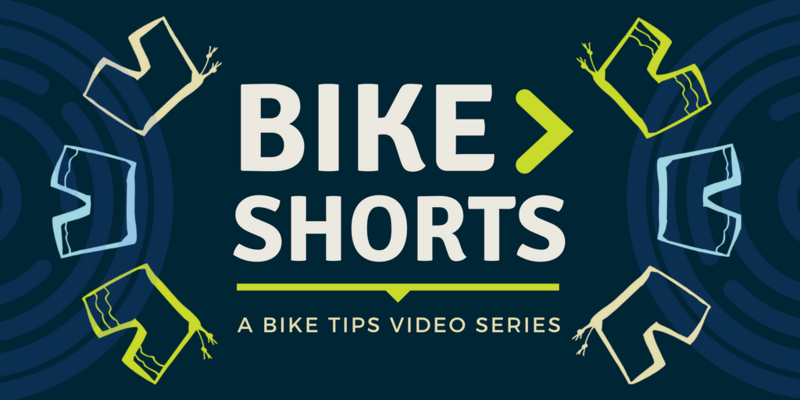 The series called “Bike Shorts” is a follow-up to the Bicycle Master Plan. Each video will run 30 to 60 seconds, and are meant for sharing with your friends, family and co-workers online through Facebook and Twitter using #ICBikeShorts. The videos, which will feature local bicyclists, will cover a range of topics, anything from fixing a flat tire to locking your bike, to trail etiquette and navigating a roundabout. You can find the videos online at www.icgov.org/BikeShorts, and on the City of Iowa City Facebook page and Twitter feed. Keep an eye out for updates! We’ll add more “Bike Shorts” as they are completed. Registering your bike with the Iowa City Police Department can help with locating and recovering if it's stolen or impounded. Watch this quick video to learn how to register your bike. Part of sharing the road includes knowing the correct way to safely pass a bicyclist. Watch this short video to learn the proper etiquette when going around cyclists. For any cyclist, using hand signals is very important. It’s equally important for drivers to understand what they mean. Watch this short video to learn the proper signals. This may seem like a simple task, but improperly locking your bike could leave you without transportation. Follow these simple steps ensure the safety of your bicycle. Iowa City has a lot of trails that are great for biking, but you want to make sure to follow these basic rules of etiquette. If you are digging your bike out of storage from the winter, or just looking to do some regular maintenance, here is a simple checklist to follow before hitting the road. Watch to learn some easy tips that can help keep young riders safe while riding bikes. Did you know that all buses in the City’s Transit System are equipped with bike racks? Combining these two modes of transportation is a great way to stay fit, save money, reduce pollution, and get where you need to go! Changing a flat tire on your bicycle may seem intimidating, but replacing it can be easy following a few simple steps. Ryan from World of Bikes breaks down the process. Picking the correct bike for your needs is extremely important. The owner of Geoff's Bike and Ski helps break down some of the different types of bicycles. Whether you are heading to a specific destination or just enjoying a leisurely ride, cycling at night can be exhilarating experience when you take the proper precautions. Michael from The Broken Spoke explains how to safely ride your bicycle at night.